Is Brad Owen considering retirement? Lt. Gov. 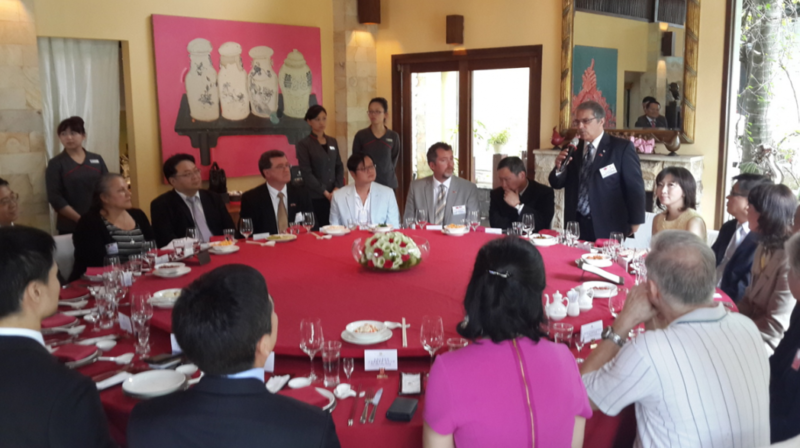 Brad Owen speaks at a salmon tasting in Taiwan. Owen’s Lt. Gov. bio mentions that he’s been in office since getting elected in 1996. He lives in Shelton and represented the 24th Legislative District in the House from 1977 to 1983 and the 35th Legislative District in the Senate from 1983 to 1997. When he left the Senate after getting elected as lieutenant governor, he was replaced by party appointment by Lena Swanson, who then lost the next election to Tim Sheldon. The job entails acting as governor while the governor is away, being president of the Senate and taking a large role in the state’s international trade missions. April 10, 2015 Election 2016Brad Owen, Lt. Gov.